The first blood of the impending Civil War was spilled when a slave owner tried to recapture a couple of his former slaves who were in the town of Christiana, Pennsylvania. When the slave owner arrived with a federal marshal, he was met with armed opponents who killed him and forced the others to flee. While 36 people were arrested for the action none were convicted. On November 7, 1849 four slaves escaped from Edward Gorsuch's estate. Two years later, Gorush heard that at least two of his slaves were in Lancaster County Pennsylvania. These runaway slaves were rumored to be living with a black farmer by the name of William Parker. 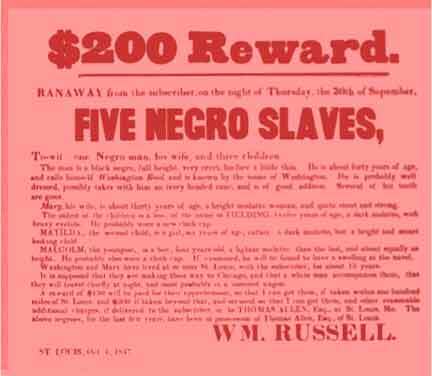 Using the powers conveyed in the Fugitive Slave Act, Gorsuch went to Philadelphia and gained a warrant to retrieve his slaves. Gorsuch then headed to Christina with his son, a Federal Marshall, and an unknown number of other men. Parker had been warned about the impending arrival of the slave owner and the marshall. William Parker headed the defense organization of free blacks in the Philadelphia area. This group was supported by the anti-slavery white community. By the time Gorsuch arrived there were large numbers of Parker's supporters at the house to protect the former slaves. Grosuch was urged to leave, but refused. Then, gunfire broke out, killing Gorsuch and wounding his son. The rest of the party fled. Gorsuch's former slaves fled to Canada, while a Grand jury indicted 36 men, (30 Black and 6 Whites) on a charge of treason, for their part in the attacks on the marshall’s party. In the end, only one person, Castner Hanaway, was brought to trial. The trial received national attention, with Congressman Thaddeus Stevenson as the lead lawyer for the defense. At the end of the trial, the jury voted to acquit in 18 minutes. The die had been cast. However; the first blood of the Civil War had been spilled. This event became known as the "Battle" or "Incident of Christiana".